Imagine the impact a reduction in blending time would have on your production process. It’s probably not anything you’ve considered. Overlooking something as simple as blending could mean that you’re missing out on extra revenue. 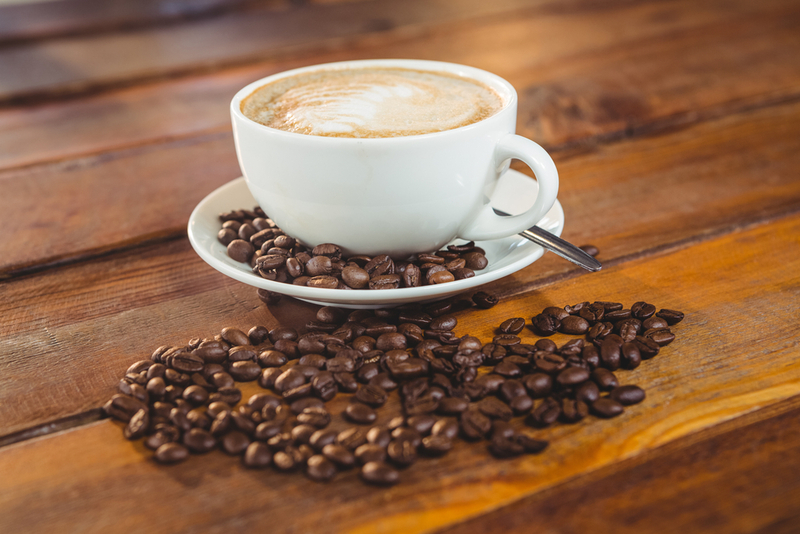 In this case study we’ll demonstrate how an established coffee manufacturer was able to achieve just this - increasing production capacity, response times and product quality as a result. Find out how you could do the same whether you manufacture coffee or other food types. Why Change Your Mixing Equipment? Having been in production since 1997, ‘Wetra Food Industries’ felt it was time to update their manufacturing facility and equipment. Both local and global product demand had increased to 35+ beverage mixes and success in their Contract Manufacturing business meant that the company needed to increase production capacity. 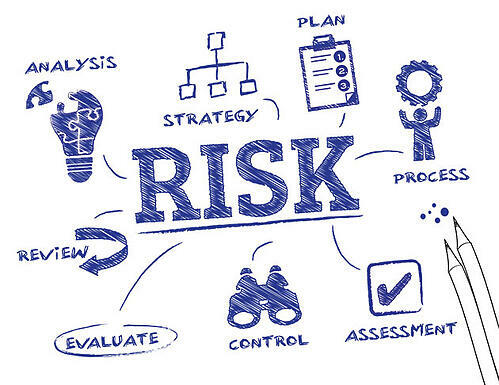 The Managing Director stipulated that they needed a flexible system which bought low levels of inventory/WIP and dust containment to ensure a clean, safe facility. Due to the need for validation of their HALAL instant food and beverage products, the factory also had to be designed with cross-contamination risks in mind. As the organisation didn’t have an in-house engineering team, Matcon carried out an initial engineering study to discover how their system was currently working and where improvements could be made. With a strong growth trajectory, future expansion plans were considered alongside the initial requirements of the project. Additional areas were included in the plans to incorporate another filling and blending area with three+ packing line stations that could be installed in the future. Matcon use the latest design software when planning the factory layouts for their customers. This approach gave the ‘Wetra’ team a visual example of exactly how the new facility could be arranged. As this project was a full renovation of Wetra’s facility, Matcon could optimise the flow of product from raw materials entering the facility from the east, flowing through the zoned process areas until leaving the factory as finished goods from the west. The company decided to install an IBC (Intermediate Bulk Container) system with no fixed mixers due to the need for a easy to clean, flexible system that allows for high production output. By decoupling each production process (filling, blending, and packing), all operations could occur simultaneously. The main time-saving advantage to using an IBC system is the reduced cleaning time (as this can also be performed off-line). In selecting an IBC system with no fixed mixers Wetra were able to reduce their blending times. With an IBC system that uses a Tumble Blender, mixing takes place within the IBC itself, therefore the blender does not need to be cleaned between recipe changes. IBCs also have no contact parts, and each utilises patented Cone Valve Technology for fast and effective discharge. 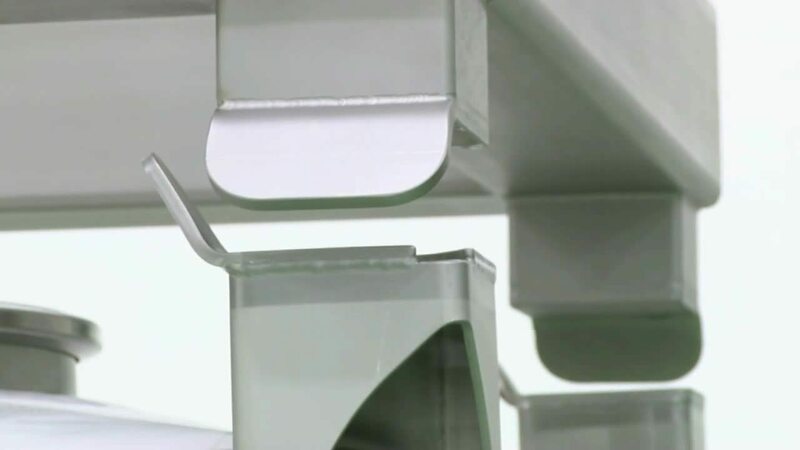 The capability to preserve blend homogeneity throughout the transfer process which was essential for maintaining a consistent and high-quality product every time. Elimination of ingredient segregation and particle rolling. Controlled powder flow using a variable lift height mechanism within the Cone Valve which allows free-flowing difficult-to-handle powders to be used without the requirement for additional feeders. A dust-free atmosphere. A key advantage of the contained IBC system which remains closed at all times. (The Cone Valve comes with an outer lip seal on the Discharge Station which removes dust hazards and significantly reduces the chances of cross-contamination). Intelligent IBC discharge - the Cone Valve opens and closes vertically using natural gravity and weight of the powder. It can also be shut-off stopping product flow completely at any time, facilitating precisely measured amounts that can be used for batch dosing or the removal of part-used IBCs from the Discharge Station. 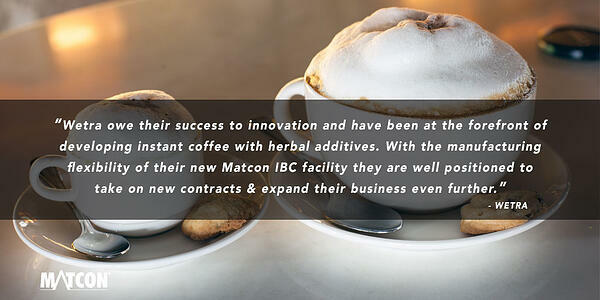 Using the Matcon IBC system, Wetra were able to move immediately from one recipe to another at any time. This gave them a fully flexible process to fulfil orders on demand. The system also enabled them to reduce blending, cleaning and production downtime whilst separating HALAL ingredients and eliminating cross-contamination. Additionally, Wetra no longer needed to store huge stocks of inventory to meet orders, saving on capital and wasted product. To find out how Matcon technology could improve your productivity and profitability, schedule a 30-minute call with one of our sales engineers. During your call we’ll explore your current manufacturing process and suggest some quick wins for you to consider. Can An IBC Blender Handle All Of My Products?